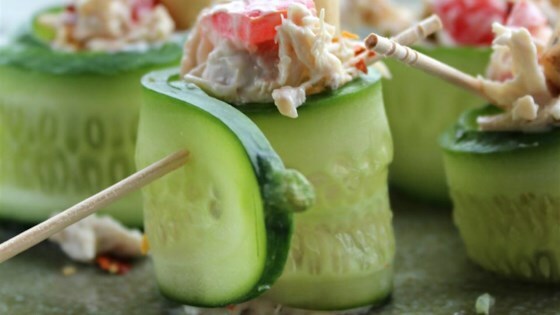 "Easy to make cucumber roll-ups filled with a chicken mixture topped with crunchy Snack Factory® Pretzel Crisps®." Mix chicken, Neufchatel cheese, mayonnaise, green onions, tomato, red pepper flakes, and garlic salt together until well blended. Lay cucumber slices flat on a work surface. Spoon two teaspoons chicken mixture on bottom (flat) edge of each slice; roll up. Secure with toothpicks and place rolls upright like cups on a serving plate. Push a Snack Factory(R) Pretzel Crisp(R) about halfway down into the chicken mixture. Chicken breasts are rolled around asparagus and cheese, breaded, and baked. Tuna can be easily substituted for the chicken.